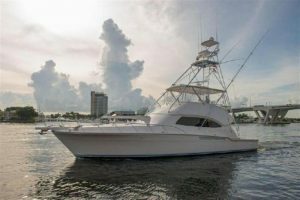 Major price reduction on this beautiful used 57' Bertram for sale! : Atlantic Yacht & Ship, Inc.
John Slate reports that there has been a major price reduction on his used 57′ Bertram yacht for sale! In the first place, this used 57′ Bertram was launched in 2005. Moreover, with a reduced asking price of $895k this yacht is ready to be sold! In fact, with her new carpet and recent full detail with polymer was she shows great. Furthermore, she has has the full 2,000 engine service! As can be seen, this used 57′ Bertram is in excellent condition. Overall this yacht has been extremely well maintained. With low hours on her desirable CAT engines she comes with all the bells and whistles. She has a new bottom, engine service, and detail all completed. Furthermore she has been recently surveyed with all survey items addressed. She has been stored beneath an in-water shed and shows like almost new! Very well appointed, with tasteful leathers and upholstery, this yacht is “turn-key” and ready to fish! She has been priced to sell. This is the lowest priced, best condition, used 57′ Bertram on the market. For more information on this beautiful used 57′ Bertram yacht for sale contact John Slate today! Check out this used 57′ Bertram yacht for sale in Florida!